In support of the 44th Anniversary of Earth Day last month, Bradley’s Menomonee Falls and Germantown facilities participated in an electronics recycling and a printing challenge. Employees were encouraged to bring in old, unwanted electronics and dispose of them in a safe, environmentally-friendly manner. Every year, 80-85% of electronics end up in landfills or incinerators, contaminating the ground and air with harmful toxins. 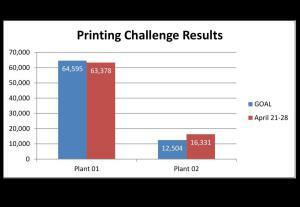 Each facility was also challenged to reduce the average number of pages printed in a week by 10%. The Menomonee Falls location won the challenge, reducing their total by 12%! At Bradley, we are committed to continuous improvement and customer satisfaction. As a responsible corporate citizen, manufacturing premium-quality commercial washroom fixtures, we’re committed to using all resources wisely, as well as safeguarding the communities and environments in which we operate.